For the bridge/tailpiece, where would I get parts that fit? Does anyone know if these posts and studs are metric or Imperial? Any recommendations for particular parts? Would a Gibson TOM and tailpiece fit with the right posts and studs? For the pickups, should I route a Jaguar pickguard, trim a Jazzmaster pickguard, or buy a blank and do the whole thing myself? Any recommendations for the pickups? I know of a few aftermarket options including Duncan, or I can just get Fenders. 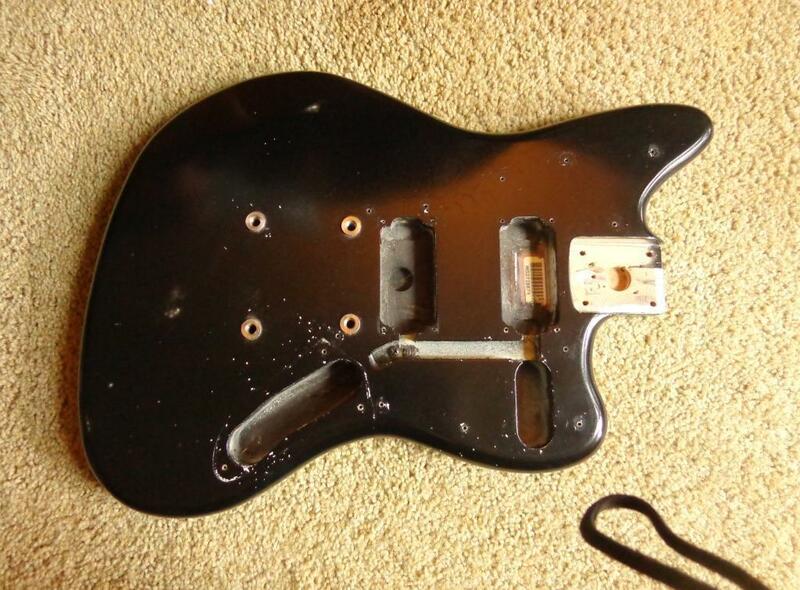 The body is set up for a tilt adjustment, but obviously a '66 Mustang neck is not. Would anyone recommend trying to retrofit the neck for tilt? It's not a collector's piece, as the decal and nut are missing, and it may need a refret. Thanks for the help!! I'm going to do a white pickguard and ReRanch Fender Custom Coral for the body and headstock. great first post, and a great idea! white pick guard on coral is going to look phenomenal. has that body been modded already? maybe i'm just not familiar enough with that guitar, but i don't recognize the two sets of posts... if i'm seeing that right. also, does your friend want the trem, or is he going with just the TOM bridge setup? either way, you should be able to use a wilkinson bridge as it should have the correct radius to match the mustang neck. keep us posted on the progress. certainly others with more expertise in these areas will chime in, too. Obviously, it LOOKS like a typical Gibby setup, but since it's a Mexican guitar, I didn't know whether the hardware would be metric or Imperial.